Some of you young whippersnappers may not be familiar with the headline to my column, but seasoned veterans know exactly what I’m talking about. The brilliant Robin Leach had lots to say about luxury, and he understood that people enjoy the finer things in life, as do I. According to the cover story, the luxury market is going through some kind of shift and you all have to be ready. Some brainiac did a study on the desires of luxury buyers in Chicagoland, and what they discovered, I probably could’ve told you already: Folks like nice things. Start with that, and the rest will come easily. No need to thank me; just share your next high-end commission with me and we’ll call it even. You know I don’t love talking about politics, but I wanted to make sure that everyone knew Chicago has a new mayor and her name is Lori Lightfoot. I feel like that is all I can say without being controversial. Did you see Shimmy Braun threw out the first pitch at the Sox home opener? Nice tryout, but it was Tony Mattar who actually made it into the big league in terms of social stats: Turns out he has a catfisher on Instagram. Someone is using his pictures and claiming to be a real estate agent, except his name is Jake. Maybe Tony just has a doppelganger? Either way Tony has a great sense of humor so he’s having fun with it. I’m not sure I’d be able to do the same thing, but then again, I don’t know how to use Instagram. April Fool’s Day just happened, and a lot of real estate friends had fun with that. Karla Mina even posted a video of herself getting fake arrested! Everyone is giving her shout-outs for her superb acting skills, except her own daughter. Karla’s mini-me should know, because the child star was once in a Sears commercial. Main Street Real Estate Group celebrated five years of business on April 4 at Basil Leaf Café in Lincoln Park. Guests enjoyed open bar and apps, and I even got to bring a plus one. 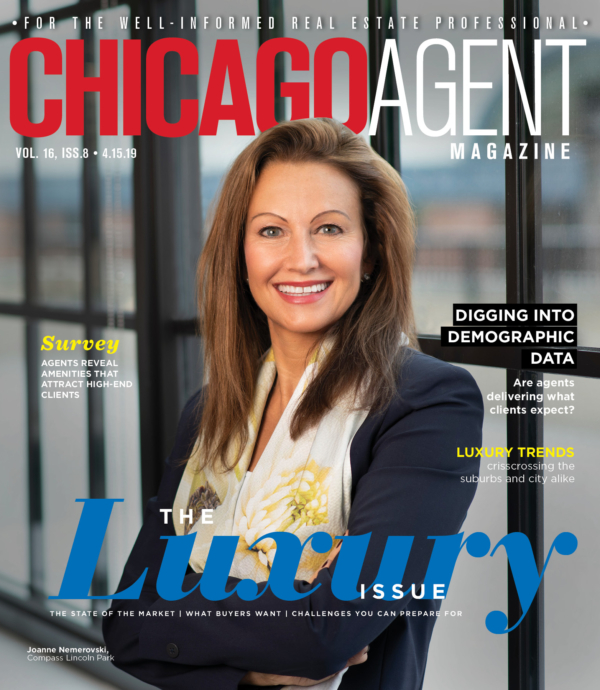 And of course, CAR held their annual sales awards on April 11 at the Lyric Opera House and Chicago Agent’s own Marci Sepulveda did an amazing job MCing with Nick Libert (one of my favorite agents to talk about in this column)! I can’t wait to get more of the behind-the-scenes scoop from both of them and check out the videos that magazine staffers snagged from the red carpet before the event started. As the April showers continue to fall, let’s give a soggy shout-out for some birthdays. Judy Gibbons celebrates on April 18, followed by David Wolf on April 19. I’m sure I point this out every year, but besties and business partners Josh Weinberg and Tommy Choi share a birthday, and on 4/20 no less. I couldn’t make this stuff up if I tried. Chad Gilbert celebrates on April 22, while Sam Sharp gets his birthday going on April 24. The ubiquitous Leigh Marcus shares a birthday with Jennifer Mills Klatt and Ivette Rodriguez Anderson on April 25, while Monica Canellis celebrates on April 26. Rounding out the month we’ve got Stephen “five years of this column and I still can’t pronounce his last name” Hnatow on the 27th and Tim Brigham on the 28th.